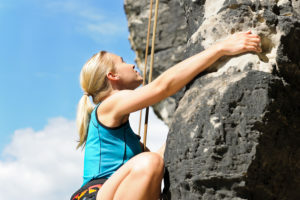 For action lovers and intense holiday climbing in Rhodes is the perfect choice. And in the southern part of the island there are mountains, which are ideal for climbing.Qualified staff shall undertake supervising climbing of small groups, on the especially located ropes. The program also includes rest and picnics on the mountainside and enjoyment of the landscape. Undoubtedly it is the perfect choice that will remain unforgettable. Pick up will be from the hotel or at the arranged pick up point. After arriving at Ladiko there is a small walk through the mountains, along the coast, approximately 5 minutes. Arriving on the spot there will be a safety briefing, explanation of the gear and information about how the program will look like.When everybody is ready we will start with rock climbing, called ‘top rope’ at our average 20 meters high natural climbing wall. There will be plenty of routes to climb, all next to each other. While climbing the clients will be ecured and be wearing a safety helmet at all times, experienced or not. There will be sandwich, fruits and water available.After climbing there is an opportunity to do a 35 meters’ rappel, passing the entrance of a big cave. This means you will be coming down by rope, hanging in the air for 30 meters long! To get to the op it includes a 20 minutes’ hike and climb, enjoying amazing views. A real adventure!This is how we close the day. From here we walk back for about 10 minutes and bring the customers to their hotel.There is a discount for children and a special price for passengers: partners/ friends or family that would like to join the climber(s). Food & drinks are included in the price for everybody. Pick up and drop off from the hotel is included in the price.